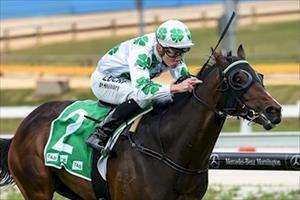 Do You Reckon led most of the way to win at Cranbourne on Friday night. Patrick Moloney took luck out of the equation starting from the outside and was positive, crossing to lead and although he was getting a little tired towards the finish had enough in hand to win the 3YO Maiden over 1400m. The son of So You Think has not been out of the first four in his four races and Moloney suggested there is further improvement. “He’s got good natural speed and that’s an asset, especially when you draw the outside,” Moloney said. “He was a little bit keen in the blinkers first time but once he got to the front he relaxed for me and we were able to get a cheap sectional before the home turn." Moloney said Do You Reckon can develop further. “He’s still a colt and still maturing so he’s done well to win a race in his first prep," Moloney said. Congratulations to the Lofty Thoroughbred Group, the owners of Do You Reckon, a $85,000 yearling purchase by Paul Moroney.